How many of the TTC's 69 subway stations meet the commission's own standards for cleanliness? Zero. How many people do they need to hire to bring things up to standards? At least 60 additional full-time employees. When will they be able to hire these cleaners? Not for a long time. Instead, 30 temporary workers will be brought on board for a six-month cleaning blitz. The federal Conservative government is rejecting calls for a public inquiry into G20 security, arguing that "it would only lend a voice to the thugs, hooligans and anarchists who traumatized Toronto last month." What? The mounting demands for an inquiry aren't about those 60 or so thugs. The calls for an inquiry are about the voices of the tens of thousands of Canadians, who had the right to peaceful assembly, and instead were silenced (first symbolically) by a violent few vandals (who weren't stopped by a billion dollar, 20,000 police officer strong force), and then stopped (quite literally) by the subsequent excessive application of unprecedented security measures (i.e. arbitrary mass arrests and temporary detention with no intention of laying charges) the following day. The people want violent thugs to be punished, but not at the expense of their Charter Rights. They're far too precious to be revoked without transparency and passage through open political processes and without public notification. A young man (perhaps a teenager) managed to pull off a string of four brazen daytime bank robberies in Oakville and Burlington. The same bandit is believed to have hit a TD, a Scotiabank, a Bank of Montreal, and an RBC -- all within about an hour's time. Clearly he's efficient at making money...but doing it the wrong way. Here's a security camera still image of the suspect. 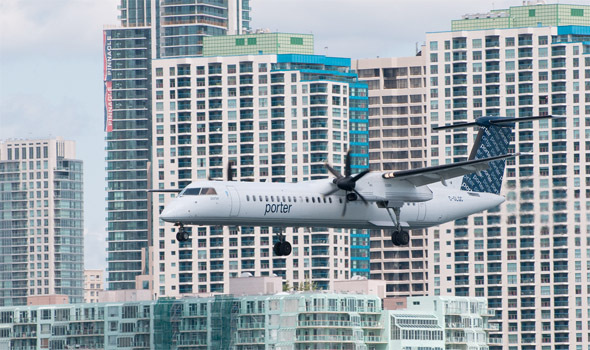 The Toronto Port Authority is continuing with major expansion and increased flight frequency out of Billy Bishop (aka Island) Airport. They'll also be building a "beautiful" 123-metre-long pedestrian tunnel (at a cost of $365,000 per metre) from the foot of Bathurst to the airport, making crossing the gap quicker and easier than the cumbersome ferry. These developments are great for business travellers and downtown jet-setters, but also face vehement opposition from city residents and city councillors, and the TPA has had the finger pointed at them for lacking transparency in the past. Apparently they're aiming to change that as well. A quadruple-decker ice hockey facility would be the first of its kind, but may pose design and logistics challenges. Are they surmountable? The latest proposal for the much needed sports facility -- to be erected at the waterfront in the Portlands -- is a multi-level arena, encased in glass, and of smaller footprint than previous design concepts. It'll be interesting to see how getting player gear and Zambonis to the upper rink levels will be accomplished. I'm thinking plenty of huge elevators. The grisly details of the execution-style killing of 17-year old Tien Pham in Chinatown this past weekend are being revealed, and police are hoping security footage and witnesses can help identify the suspect. At 3 a.m. on Saturday, Pham was approached by a man who entered by the back door of the Excellent Cantonese Seafood restaurant. The suspect fired a single shot to the back of the victim's head, and calmly walked away. Police are calling the homicide deliberate and calculated. And also in TTC news, the commission has decided to spare four homes from expropriation and spend an extra $3.4million on construction of secondary exits from Donlands and Greenwood stations. A few homeowners can breath a huge sigh of relief, thanks to the successful amounting of pressure from area residents and city politicians. Photo: "TTC state of decay" by dan cronin.jpg and "Porter" by Ken Sekiguchi, members of the blogTO Flickr pool.